The 2018-19 course has now ended, registration will reopen in the Summer of 2019 for the next cycle. Digging Deeper: Cosmic and Earthly Evolution for Farmers is an advanced biodynamic course designed for those who have completed The Individuality of the Farm and wish to delve deeper into the spiritual scientific foundations of biodynamics. Rudolf Steiner gave thousands of lectures, but wrote only a couple dozen books. The book An Outline of Esoteric Science (also titled Occult Science in previous translations) is Steiner's most comprehensive summary of the entirety of his work meant for the general public, and lays the foundation for most of the lecture courses he gave, including Agriculture. The curriculum of this course is centered on Chapter 4 of An Outline of Esoteric Science, which looks at the evolution of our Solar System, the Earth, the kingdoms of nature and humanity. We will specifically explore those aspects that relate to our work on the land. This course is open only to those who have completed the introductory course, The Individuality of the Farm, either through the Biodynamic Association or at Saugeen River School for Sacred Agriculture. Together with The Individuality of the Farm, the curriculum of this course is designed to complete the classroom study requirement for the North American Biodynamic Apprenticeship Program (NABDAP), and NABDAP apprentices are encouraged to participate. To fully participate in the live video sessions, you will need to have a reliable internet connection and a computer, tablet, or smart phone with camera and microphone. If you don’t have a device that will support this video technology, you may access the course via telephone. Video and audio recordings of each weekly session will be available to participants to review content or make up for a missed class. To ensure continuity and a high-quality educational experience, participants are asked to commit to the full four months and late registrations will not be accepted. A certificate of completion will be available. For more details on certificate requirements, email Kaitlin at kaitlin@biodynamics.com. Steiner, Rudolf. An Outline of Esoteric Science. SteinerBooks, 1997. Available from Steiner Books at www.steinerbooks.org or 703-661-1594. Chapters 1-3 of the book are expected to be read before the first session on October 24. These first three chapters are a summary and retelling of what students have already read in Theosophy for The Individuality of the Farm, but from a slightly different perspective. Reading them before this course will help you get back into the context for Chapter 4 which will be the main focus of Digging Deeper. Registration will reopen in August 2018. Tuition for this four-month, 14-session interactive course is $300. Soil Builder members receive a discounted rate of $270 (10% off), Seed Sower and above members receive a rate of $240 (20% off). Not a member? You can join for as little as $5 and receive the discount instantly. 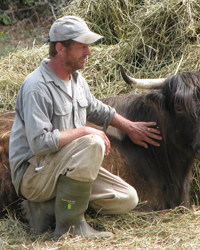 Partial scholarships are available through the Biodynamic Scholarship Fund. If you need financial assistance, please apply as soon as possible and no later than October 1. "I feel like I can never hear and discuss these concepts enough times, especially with Cory as teacher/facilitator. He is fantastic! " "Cory offered us a rich mosaic of ideas and questions -- I'm sure I will continue to return to this work of this class as I continue to study Steiner."